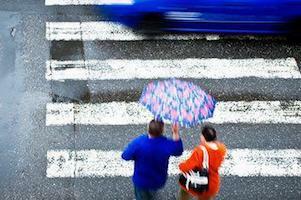 Have you been hit by a car or truck while walking in a crosswalk? Have you suffered serious injuries such as fractures and spinal cord damage? Are you wondering where to turn for skilled legal counsel from a dedicated pedestrian accident attorney? At the law firm of Corsiglia McMahon & Allard, L.L.P., in San Jose, we represent pedestrian accident victims and their families throughout Northern California. To set up a free attorney consultation, contact us today. You will not pay anything unless we win your case. Speak to one of our San Jose pedestrian accident lawyers today by calling (408) 289-1417.
Notable Case Result: $650,000 recovered for a family who lost its father in a pedestrian-automobile accident as a result of a negligently designed and maintained private parking lot. Pedestrians, even more so than motorcyclists and bicyclists, are extremely vulnerable to catastrophic injuries and fatalities in all types of auto accidents. When negligent drivers cause pedestrian accidents, they can do permanent harm to victims and their families. The lawyers at our firm have helped many seriously injured pedestrians and grieving families hold irresponsible drivers accountable and obtain monetary damages. We work with top-notch accident reconstructionists and other credible experts to build each client’s claim for compensation. We are prepared to stand up to big insurance companies and take cases all the way through the trial process if necessary to obtain satisfactory results. Sometimes, an accident is more than one person’s fault. Maybe you stepped out onto the street while you did not have the right of way. In this common scenario, it does not mean the driver who hit you could not have made reasonable efforts to avoid doing so. Our pedestrian injury attorneys are experienced at analyzing accidents step by step to determine who can be held at least partially responsible in a court of law. To discuss your pedestrian accident circumstances with an experienced San Jose pedestrian accident lawyer, contact us today at (408) 289-1417. We serve clients throughout Northern California, including the areas of Gilroy, Mountain View, Sunnyvale, Santa Clara, and San Jose.